What is Next Level Listening? 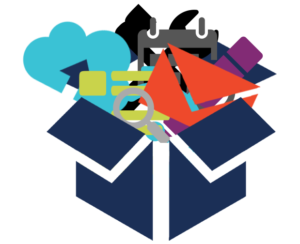 Next Level Listening is a toolkit synthesized from communication theory, non-verbal communications training, and Neuro-Linguistic Programming (NLP). When used in a traditional ICF certified coaching context these tools add depth and insight to coaching conversations, allowing the coach to reflect back observations that create new awareness and finer distinctions about non-verbal behavior. NLP is described as the study and modeling of excellence – observing individuals who have experienced success and identifying how they use their winning life strategies. If an aspect of life isn’t working, it is because something about the strategy being used to handle that part of life needs to be surfaced, understood, and redefined to be useful. Improving the strategy for dealing with a specific aspect of life alters the outcome of everything that follows. All our life strategies are operating below the threshold of consciousness and can be brought forward by a trained coach so they can be seen, heard, felt, and then fine-tuned for success. By building an awareness of the signals, metaphors, symbols, and signs of subconscious communication, we can move to a new way of thinking about ourselves and begin to change the way we interact in the world. For people who are stuck there is usually a blind spot in their own behavior. Procrastination is a classic example of a behavior that exists in the habit-holding part of the brain and is outside of conscious awareness. If clients are berating themselves over procrastination and know it is working against their stated goals, then they are engaged in the struggle between conscious and unconscious behavior choices. They may even have had full conversations with themselves about what they are doing and what they want to be doing, but aren’t. Being in a listening profession such as counseling, therapy, or coaching requires being present with clients. Coaches pay attention to client’s stories and metaphors while working with them toward a common goal for each session. What are we “Next Level Listening” to? Lots of clues in non-verbal behavior are familiar to professional coaches. In this blog I address the Ten Tune-Ins of Next Level Listening, explain the model and provide some instruction on putting it into practice. Identifying vocal tonalities and onomatopoeia – Sighs, noises, animal impersonations with an emotional sound that seems to give the sound a meaning – like “happy,” “disappointed” or “exhausted” sighs or tonalities. Noticing negation – expressing ideas using negative words like un-, not, and but. Spotting “Impoverished Representations” – when a mental concept is missing entire representational aspects and the missing piece is needed to make a change or create a transformation of meaning. Here are short explanatory summary of these ten tune-ins. In future blogs each of these will be explored in more depth. 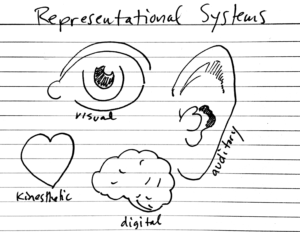 Representations are words that describe experiences for use in storytelling. We all tell stories and the way we remember what happened is represented in our mind by what we recall – some parts are visual, some parts are sounds and dialogue (internal and external), and some parts are physical sensations and emotions. Other parts are analytical or technical. These are categorized as Visual, Auditory, Kinesthetic, and Digital language, and they are the building blocks of our personal experiences. Every story in your life is a composite of these representations and we richly recall them when vividly reliving something that happened in the past. In Next Level Listening, the goal is to recognize representations and to be in the same representational system clients use when they relate a story from their lives. There is a lot of representational information available. The word “listens” is an auditory representation. In order to match their representation, an auditory response is needed. The client feels heard and understood. If the coach mismatches the representation either intentionally or unintentionally there will be less connection to the client. Let’s take a look at a coach mismatching the client by using visual representations. This is likely to upset the client subconsciously and they may feel totally misunderstood. A kinesthetic representation in a response can seem empathetic or compassionate, yet because of the mismatch, can also create distance rather than connection. Saying “I get it,” or “How do you feel about that?” misses the auditory representation in the initial statement (being listened to) and instead advances the statement in terms of feelings. Understanding intentional matched representations is a powerful way to build trust at a deep level with a client. Additionally, researching and understanding the concept of Clean Language will help to avoid mistakenly projecting the coach’s biases or conclusions into the dialogue. The basis of Clean Language is simple – stay out of your client’s metaphors as much as possible – restate what they say verbatim, if possible. You’d be amazed the impact this has on the client’s experience of you as a coach. Recognizing the deeper structure of sentences that require clarity about missing pieces of specific information. Sentences operate on multiple levels. On the surface they can seem simple, yet each word can evoke a variety of meanings and mental pictures, sounds, and emotions. It is important to seek the deep structure of meaning by being curious about details, avoiding assumption, and seeking clarity of understanding. Let’s learn more about that omni-present boss. If a client says “My boss never listens to me,” there is a lot of information that has to be filled in and explored. Without seeking the deeper structure there is a very broad set of possible meanings at play, including the ones that we could fill in as a coach. Reading and interpreting the way a client’s eyes move in relation to the regions of the brain they are using. Eye-accessing cues have been documented and were first codified by Richard Bandler and John Grinder in the book “Frogs Into Princes.” At the time, there was very little known about the observed connection between eye movement and the nature of creating or recalling a thought or a memory. Decades of field practice by practitioners demonstrates that eye movements correspond with activity in specific areas of the brain and can be a means of intuiting mental activity. Noting eye movements gives the coach an opportunity to ask questions that can move an idea, concept of thought from inside the client’s mind to the outside where it can be discussed. This article about eye-accessing cues is a great summary of the phenomenon – I have quoted it here. 1) Some people have these directions of eye movements completely reversed, meaning that visual remembering becomes upper left instead of upper right and so on. This is usually the case with left-handed people (but not all of them). So it is a good idea to ask a test question first which you know the answer of to check whether or not the eye movements are reversed. 3) Use clean questions while looking for eye accessing cues. Clean questions are those questions that do not trigger any extra, unnecessary thought patterns that can interfere with your observations. An example of a clean question would be, “What color is your car?” The answer to this question is a simple visual response. But if you ask, “Can you tell me what color is your car?” then it is not a clean question because the person will first engage in an inner dialogue with himself to answer the question, “Can I?” This will make his eyes move to lower right and you will be confused because you were expecting a visual response. 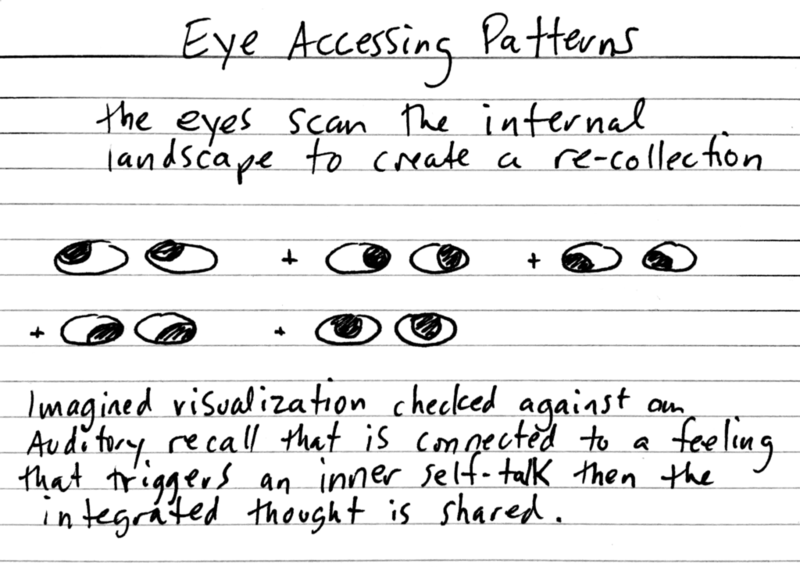 Here is a quick illustration of what is observable in the way eyes move and their connection to thought processes. Eye accessing cues are a controversial subject for some reason. In my experience they are very accurate at revealing a process and not the content of a client’s thoughts. Some have asserted that double blind experiments do not support the hypothesis of eye accessing. By all means do not use it if it does not work for you. Eye accessing cues are connected to one another. The pattern that occurs when observing them in action reveals an underlying mental process or strategy. Being able to see the strategy in action is very helpful to the client. I will calibrate with the client and share what I observed to verify with their actual experience. As a coach, there is a context of trust that allows us to have a conversation about it. 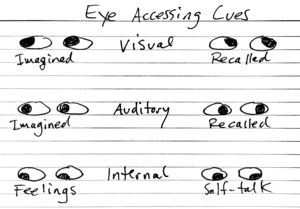 The eyes traverse the mental landscape to indicate which representations will be part of a recollection. Most people who have experienced social success in life have learned that there are times where they have thoughts or feelings that disagree with others in their environment. It is also possible that a person knows something about themselves and their situation that is at odds with their own sense of self, or of their own beliefs about right and wrong. This is most visible in political shows and when journalists ask questions of a political operative where the truth is different than the “appropriate” answer. Becoming attuned to micro-expressions in clients is a key skill to develop. I want to stress that these are not mind reading or lie detection skills. They are a way to identify and ask questions to deepen the relationship to the client and her view of the world. If, for example, in a coaching conversation with a person contemplating going back to college for a degree, the coach might ask “Do you have enough in savings to afford to take this on?” If the client seems to be nodding both yes and no, or moving her head in a circular fashion, that is a clue a coach may use to ask a level three question. Notice there is no judgment, accusation, mind reading or lie detection. The coach states what is observed. After a calibration, the coach can ask the same question and the client will respond. Observe the response to see if the non-verbal signals are more clearly defined. Example Video: This video demonstrates several Next Level Listening principles. It gives a background to the story, then we examine the behavior of the person (who was found guilty of the crime). This covers an example of Representational Systems, Eye Accessing Cues, and Incongruence and lasts 2:25. A client’s tonality when using onomatopoeia – Sighs, noises, animal impersonations with an emotional sound that seems to give the sound a meaning – like “happy,” “disappointed” or “exhausted” sighs. There are many pseudo-verbal ways that people communicate. Noises and sounds that carry an emotional subtext are another opportunity to ask questions. Many times the tonality and subtext of onomatopoeia can be below the threshold of consciousness. This is an opportunity to ask a question in an unusual way, by reflecting back the onomatopoeia to the client. This is best handled with a “clean language” approach that keeps the meaning with the client and is not interpreted by the coach. This will move the conversation to a different level for the client, as they will gain awareness of the sound and will explore its meaning with the coach. This keeps meaning with the client while bringing unconscious behavior forward to be discussed. Most communication is non-verbal. We can debate over exact percentages or dig into all the different research that explores this phenomenon if we like, however a quick Google search will tell you that non-verbals are most of the communication – as much as 90%. As we tell stories as human beings we have more than just words available to us. We have images, sounds, feelings and these exist in our minds as tableaus, landscapes, or even movies. These spaces are described with non-verbal gestures that share what we see in our mind’s eye. Really tuning in to the gestures that go with a description of an incident will provide a lot of communication. Those locations in space are real to the storyteller and as a coach it is essential to pay attention to where the action is taking place. In treating those locations with respect it is possible move them around in space, with permission of the client and in doing so, realize that a in redirecting the attention to a different location in the mental landscape can provide a literal change of perspective and point of view. This blog post about being credulous when working with metaphors includes an example of interacting with a client’s non-verbal gestures and mental locations. Concepts or processes that have been “fixed” into a single word (that is called a nominalization). Words like Communication, Liberty, Freedom, Relationship are examples. A Nominalization in NLP is a word which pretends to be a noun but is not tangible; in other words you could not place your hand on communication, or a relationship, but these words are used as if they are nouns and hard real ‘things’. It can be a verb or another process word that has been formed into an abstract noun. Nominalizations can be a source of confusion in communication – both internal and external dialogues run the risk of becoming confusing when a process is described as a thing. Now the coach and client are exploring the specific ways the client interacts with her coworker. This is much more effective than exploring the concept of a relationship where the two parties might not have a shared understanding of what constitutes the act of relating with another person. Did you notice that there is another nominalization in there that needs to be addressed? The word rude is a being treated as an object as well. You can’t pick up rude and toss it around like a baseball! Be on the lookout for nominalizations and consider how to be curious about the process it is describing. This is one imaginary interaction – this client could have gone in any possible direction, however we can see that the term relationship in this case is about something that has very little to do with work at all. We couldn’t have known that if we hadn’t explored and challenged that nominalization to reveal its process components. Our brains entrain through language. A consistent focus on what is not wanted without selecting what is wanted can create a vicious cycle that creates negative emotional responses in other people. To be coachable, the client has to be ready to take on specific actions. If situations are mostly described by what they are not, it can create a situation where confusion can make commitment difficult. These two sentences seem the same at the surface level until you understand that in the inner mind of all humans there is no such thing as “not.” To think of the thing you will not do, you must first generate a consideration of the thing. Do not think of your big toe on your left foot. You had to do it, even though the instruction was clear: Do NOT think of your big toe on your left foot. It happened again. Now the way you went about thinking about not thinking about the thing you had to think about is unique to you as an individual. The end result is that before something can be “not considered” it must first be considered. It is how our brains work. To change, it is crucial to be become aware of this fact of thinking. From there a person can identify and reframe the concept of THINKING at the origin point, and to recognize and accept if a negating thought comes up – simply be aware that to not do something is to consider doing it and deciding not to. It is far more efficient to create a thought of what we intend to do and avoid mental cycles on invoking and negating things. Please see my blog post about The Insidious Power of Negative Sentences for a more in depth exploration of how thought and reality are created in this sort of language, and what to do about breaking the habit and creating something more useful with positive wording. Ultimatums are important to note. When an ultimatum is part of a story it is designed through language to eliminate or suppress possibility for change. As long as something “always” happens, there is no path for having it not happen. In life, there are very few situations where an ultimatum is actually enforceable or even true. Even in matters of law, there are occasional exceptions. When we look back over the totality of our experiences we can find situations either in our own lives or of the people we know where something happened, even though we may be sure it “never” happens. To address language that limits choice we have to first identify those times where something did happen that never happens, or the case where something that always happens did not happen. Merely identifying that there are no true absolutes creates a new awareness that something different can occur. “Impoverished Representations” – when a mental concept is missing entire representational aspects and the missing piece is needed to make a change or create a transformation of meaning. The first Tune-In was noticing how memories and concepts are represented by a client and turned into an interlocking visual, kinesthetic, auditory, and digital experience in their mind. As a coach it is very valuable when listening to ask questions to help a client to have a full recollection (re- collection: collecting it all again) of an experience. Getting curious about the representation that is absent in the story can help awaken missing resources in the client, or make for a richer experience where a key understanding has been hidden. * is a kinesthetic representation and ** is a visual representation. This reintroduces the auditory representation into the narrative and creates an entirely new area to be curious about that the client did not bring forward in the first recollection. By exploring in areas the client habitually doesn’t will open up new paths to understanding themselves and the totality of the experience for them. Experiment with these ten tune-ins and with practice and awareness you’ll create a magical connection with clients. Give each one a try and notice how it affects your coaching conversations. Enjoy!